May be mounted directly underneath head pulley. Can be used singly or in tandem as a secondary scraper. Suitable for all types of conveyor belts and metal fastening systems. Specially formulated polymeric blades gives maximum life, and keep the possibility of damage to belt repairs, splices and metal fasteners to a minimum. Patented blade design ensures optimum combination of flexibilty and stiffness to adapt to belt profile. Patented V base blade mounting makes blade changing simple, eliminating the need to remove the scraper from its mountings. 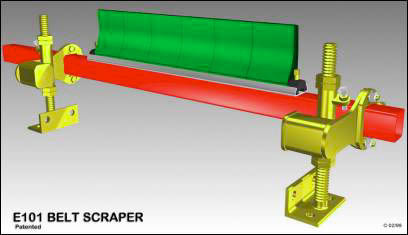 Brelko torsion mountings allow the scraper to maintain a constant pressure on the belt and greatly extend adjustment intervals. Also available with standard adjustable mountings. Universal choice for most cleaning applications. Unique V base torsion holder makes blade changing simple eliminating the need to remove the scraper from its mountings. Twin arm design of the torsion holder prevents radial & lateral blade oscillations and only allows longitudinal blade movement thus ensuring uniform & constant blade contact with the belt, irrespective of variations in belt thicknesses and surface conditions. Light weight polymeric material used for the torsion holder ensures ease of handling, corrosion protection & minimum impact on belt surface after deflection. 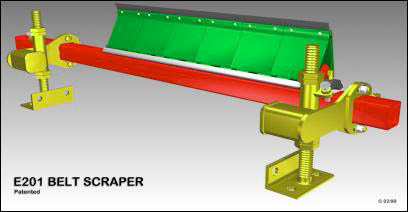 Torsion holder design ensures accurate assembly & integral skirts results in cleaner running scraper. As a secondary scraper to ensure maximum removal of wet and fine carryback. Specifically designed for use on belts using metal fastening systems. 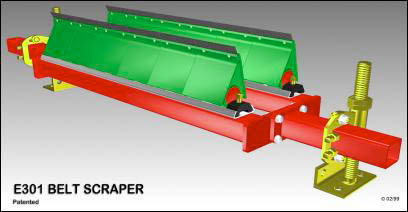 Ideally suited for conveyors where belts of different thicknesses have been joined together. Overlapping double row configuration ensures optimal removal of carryback. Double row three piece shaft arrangement allows easier installation.